Quiltville's Quips & Snips!! : Galaxy-Gram! A Jamestown Landing Afternoon! Galaxy-Gram! A Jamestown Landing Afternoon! Greetings from McKinney, Texas where all 29 of us are deep into string piecing land! We spent the morning making half square triangles and enjoyed a wonderful show and share after lunch. 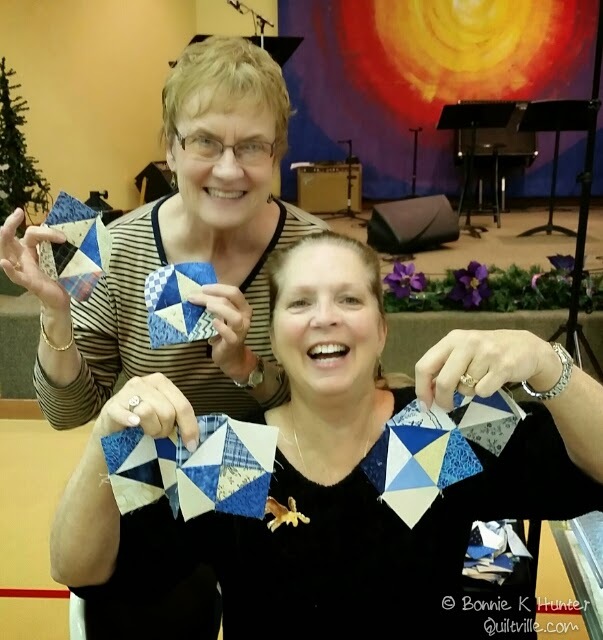 Half square triangles turned into broken dishes units which quickly turned into stars and our string blocks will become the sashing surrounding each and every one. 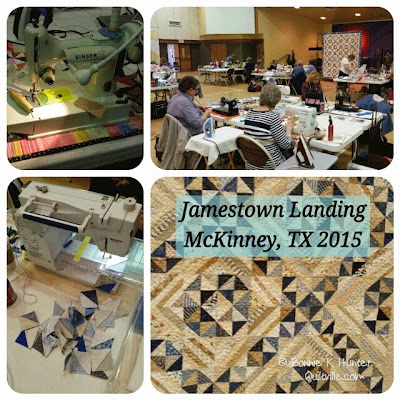 I've had a great time in Texas reconnecting with these quilters I have come to know as friends. 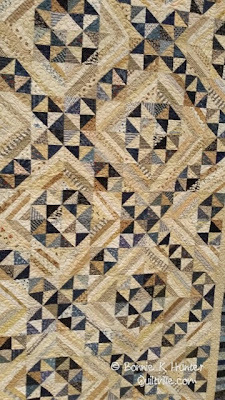 My best wishes to them all through the next year, and I can't wait to see the quilt they will finish from these workshops over the past eight days. There are a couple hours left of class, then we will pack it all up and I will head to the airport, stay the night at an airport hotel and fly out to Phoenix in the morning. Thank you for an awesome week plus, Texas! It looks like everyone had such a great time. 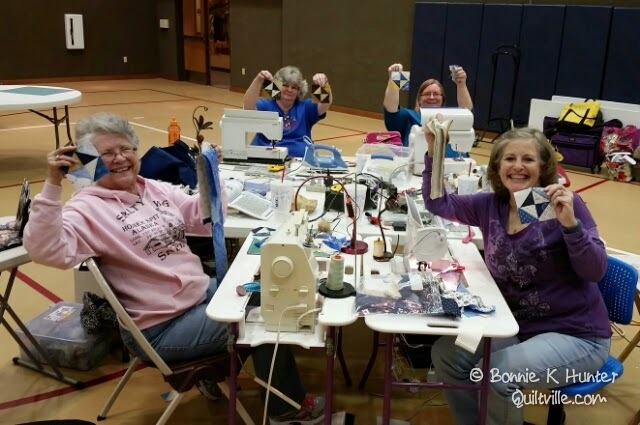 Lots of fun quilting together - makes up for the airport hotel. 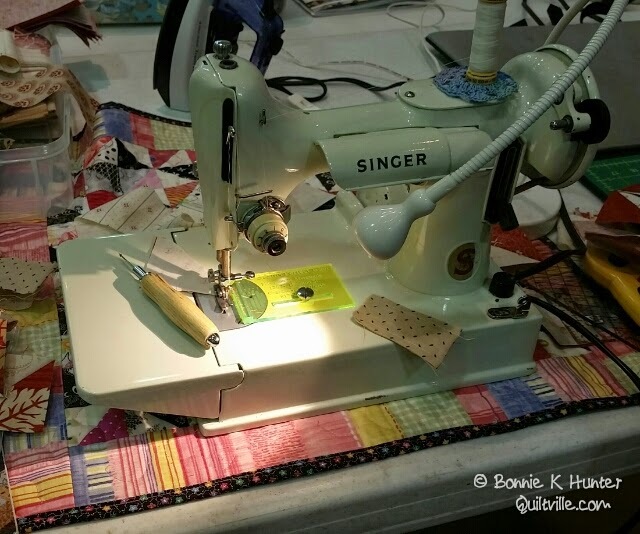 If Susan from Quilt Asylum is around, tell her that Magpie Anna says hi! Loving the pictures. Anna in IL, where it's cold and getting colder! EVERYtime I see a picture of Jamestown, I say I really want to make it! THIS IS THE YEAR!! After I complete a few more UFO's, I'm on it! Wish I could've seen you, Bonnie, as you weren't far from Ft. Worth! Safe flight to Phoenix! I want to go visit so badly! Soon, maybe February! Are you going to be at Road to California in January? 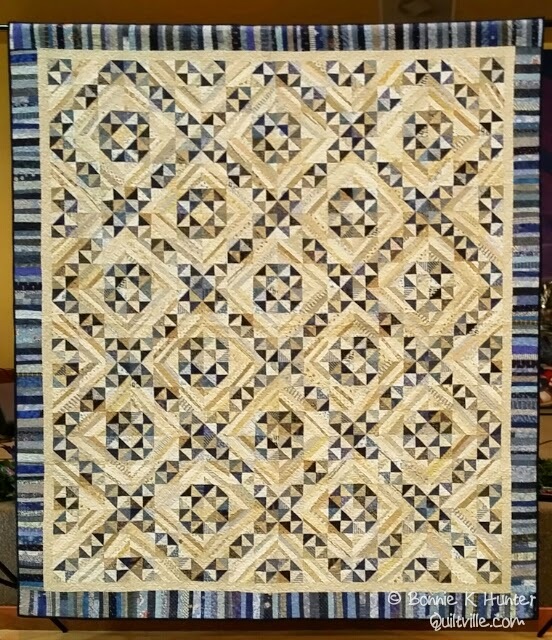 I am working on this quilt - it is one of the 3 in progress right now!! Actually a friend and I are doing this 'together' even though we are MILES apart - I am here in Canada and she lives in the States!!! But is fun to keep each other posted on how we are doing - this quilt is so beautiful!! The other two are of course your latest mystery and Fair & Square!! This one is getting me excited to see it done - I am really liking how it is looking right now while in still in pieces!!! Off to get some good sewing done here!!! I noticed the yellow plastic seam guide on the featherweight. Can someone tell me what it is called or where I can get one? Thanks! Roxy, Bonnie sells these seam guides in her store. YOu can buy one with a book, or a pack of 6. I love it. ROXY---Go to novamontgomery.com and look at her straight seam guide. $13.50, I think. It's clear acrylic, though. Glenda, I realized that after I looked on Bonnie's website. I've searched all over the web and haven't seen one like this. Hoping someone knows where we can get it. Seams Perfect is the one! Thanks. Seams perfect is the one I use on all my vintage machines it does come from Houston Street Mercantile and Nova Montgomery also has one that is clear. Either are great! I had a wonderful time sewing with all these wonderful ladies and Bonnie our teacher, friend , and hint master! Thanks Bonnie for wonderful way to start every new year, see you next year! Safe travels and enjoy your Arizona family time. Thanks for the info on Seams Perfect. Return to the Airport, Day One! 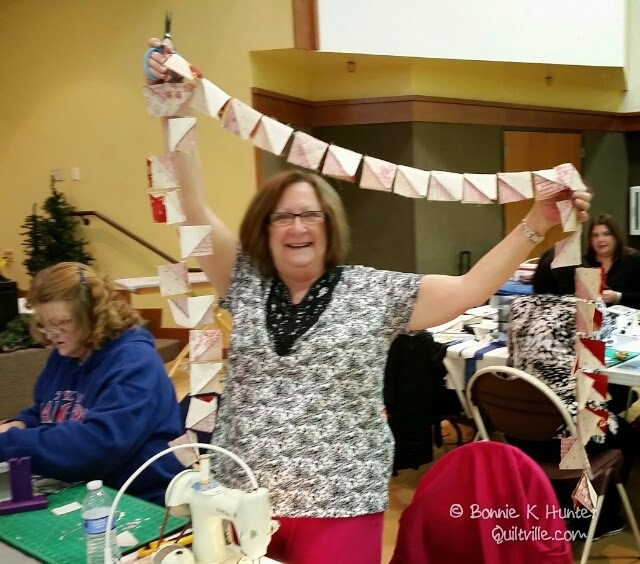 2015 Craftsy Blogger Awards Voting Time! Charlotte Antique Run, Part 2! A Travel Day to Boone! 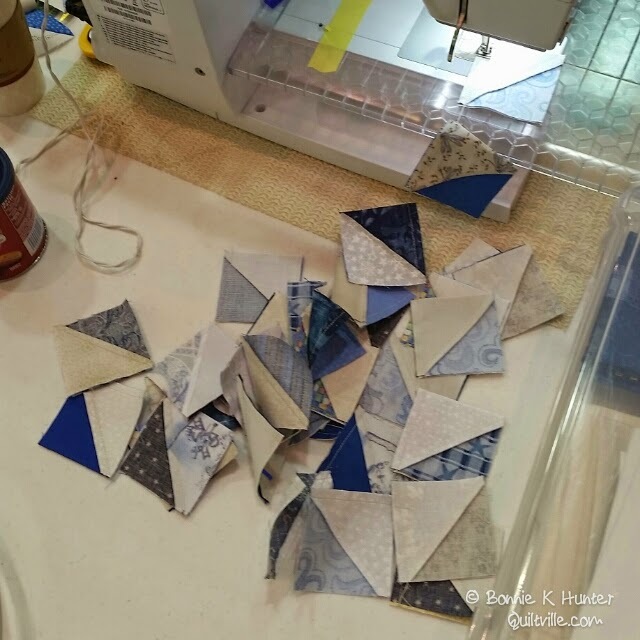 Utterly and Completely Addicted to Scraps! While Bonnie Waited: Antiquing in Charlotte! Quilt Villa’s Table For Four! Some Etowah Valley Show & Share! Galaxy-Gram! While Bonnie Waits in Charlotte! Midnigh Flight, All Day Long in Georgia! Galaxy-Gram! an Etowah Valley Birthday! Another Year older in Cartersville! A Bit of Clarkesville Show & Share! A Blue Heaven Day in Clarkesville, GA! And Then THIS Did Come Home!! An Afternoon Trek toward Helen, GA! All About Cutting and Blazing Trails! Galaxy-Gram! Time out for ATVs! A Sunny Blue Ridge Mountain Saturday! Catching up and Keeping Up! A Rose of a Day! Show & Share in Arizona! Galaxy-Gram! Rest, Walk & Stitch! 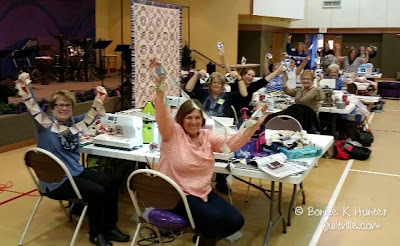 San Manuel & the Copper thimble Quilters! Pineapple Blossoms Down in San Manuel! Cathedral Stars in Chandler, AZ! Galaxy-Gram Deep in the Heart of Chandler! And They Sewed in Chandler! Happy Scrappy Houses on a Chandler Afternoon! Just a Bit more Texas Show & Share! 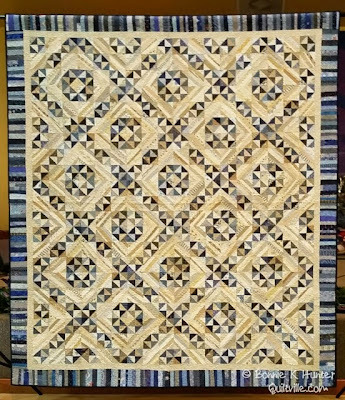 Quilt Asylum & Cathedral Stars! Orca Bay Day with the Garland Guild! Galaxy-Gram! A Cathedral Stars Afternoon! Mystery Monday Link-Up, Part 6! More Show & Share Wonderfulness! Stitchin’ at Fabric Fanatics, Day 5! Galaxy-Gram! Scrap Crystals in Plano! A Bow-Dacious Mother & Daughter Day!